CD46 acts as a cofactor for complement factor I, a serine protease, which protects autologous cells against complement-mediated injury by cleaving C3b and C4b deposited on host tissue. CD46 acts as a cofactor for complement factor I, a serine protease, which protects autologous cells against complement-mediated injury by cleaving C3b and C4b deposited on host tissue. It may be involved in the fusion of the spermatozoa with the oocyte during fertilization. CD46 acts as a co-stimulatory factor for T-cells, which induces the differentiation of CD4 into T-regulatory 1 cells. T-regulatory 1 cells suppress immune responses by secreting interleukin-10, and therefore are thought to prevent autoimmunity. A number of viral and bacterial pathogens seem to exploit this property and directly induce an immunosuppressive phenotype in T-cells by binding to CD46. 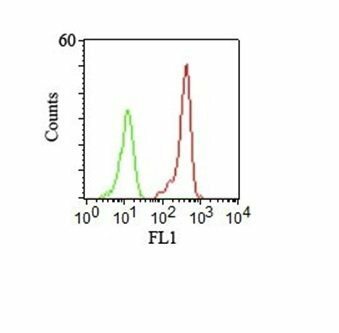 Catalog number key for antibody number 0175, Anti-CD46 (122.2) The prefix indicates conjugation, followed by the antibody number and size suffix.